How Does Sound Travel Through A String? Use a classic children’s game to demonstrate the ability of sound to travel through an object. Using the point of the scissors, poke a hole in the middle of the bottom of each cup. Stand a few feet away from a friend and talk to each other in normal voices. Keep moving apart until you can no longer hear each other well enough to have a conversation. Hold one of the cups up to your mouth and speak into it while your friend listens into the other. Can you hear each other? Next cut a length of string long enough to stretch between you and your friend when you could no longer talk to each other. Poke the ends of the string through the holes in the bottoms of the cups and tape the ends securely to these bottoms. Hold onto one cup and have your friend hold onto the other and walk away until the string is taut. Talk into one cup while your friend holds the other cup over her ear. Switch. 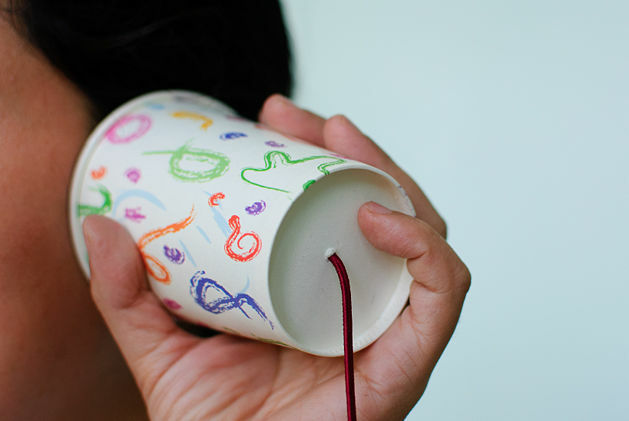 Now can you hear each other through the cups? Discuss the possible reason for why attaching the cups with the string allowed you to each other.